The Nineteenth Judicial District Commission on Judicial Performance recommends by a unanimous vote of 10-0 that Judge Dana Nichols BE RETAINED. Judge Nichols was appointed to the Weld County Court bench in 2007. Before her appointment, she had served as a Deputy Public Defender for nearly 10 years in Greeley, Pueblo, Colorado Springs, and the Colorado State Appellate offices. She spent three years in private civil practice in Denver with the firm Kennedy & Christopher. P.C. 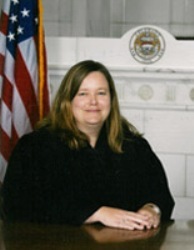 Judge Nichols obtained her law degree from the University of Colorado School of Law and her undergraduate degree in biological science from Colorado State University. Judge Nichols is president of the County Court Judges Association and remains current in all areas of the law by attending the State Judicial Conference, the Colorado Collaborative Justice Conference, and the Weld County Bar Association Nuts and & Bolts Seminar. In addition she authors articles for the Colorado DUI Benchbook each year. She believes that the courts should be accessible, fair, and humane for everyone who enters the judicial system. Judge Nichols’ docket consists of civil disputes, domestic violence, and DUI cases. Judge Nichols’ overall average rating on surveys of attorneys and non-attorneys was 3.22. The overall average grade (2.95) for Judge Nichols by attorneys was below the average grade for all County Court Judges standing for retention; and the overall average grade (3.49) given by non-attorneys was slightly lower than the overall average grade for all County Court Judges. Judge Nichols scored highest in case management among attorneys and highest in communication and diligence from non-attorneys. An example of Judge Nichols’ diligence is that when she took over the DUI Treatment Court, she took steps to inform and prepare herself by attending the Colorado Collaborative Justice Conference, met with the outgoing DUI Court judge, and observed court. During her interview, Judge Nichols made clear that she believes that Colorado’s system of judicial performance evaluation has provided good feedback for improvement. She pays close attention to comments and ratings on the surveys and uses that information as a learning tool. In an effort to improve her performance, she has made a concerted effort to help make her courtroom welcoming and to give people (both attorneys and non-attorneys) the time they need to be heard.